Aston-Martin 2 Litre & a Lagonda 2.6. Homepage. 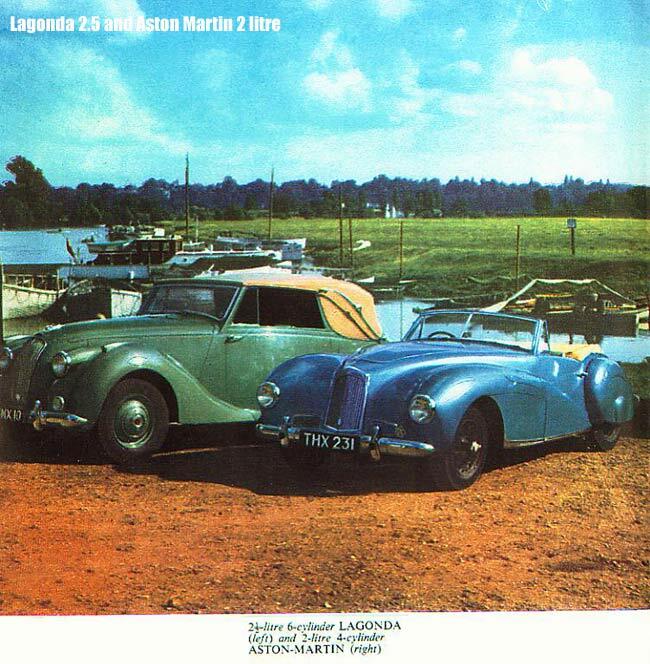 This page: Post-war advertising for the 2 Litre Aston Martin and also the 2.6 Lagonda. Aston Martin 2 litre drop head coupe & 2.5 litre Lagonda roadster. Les sent this scan over recently, that shows two products from the Aston-Martin portfolio of sporting machines. Interestingly, a quick check of the Motor Vehicle Licensing website suggests that the pale blue 2 litre Aston-Martin, on the right of this period picture, is still around, or at least still registered. I'd be interested to see current photos of THX 231 if anyone can help? the MVL site suggests that this car was built in 1948, and has a (4 cylinder) engine of 1970cc - colour still recorded as being blue. Unfortunately I can't quite make out the registration of the 6 cylinder Lagonda dhc parked alongside, ?MX 10 is the nearest I can get to it. These handsome tourers were bodied from aluminium - I remember finding a fixed head coupe Lagonda similar to this dumped behind some shops, looking slightly sorry for itself, with an immediately post-war Lagonda for company (fitted with a push button electronic gear change system). In 1947, Lagonda was taken over by Aston-Martin, itself owned by David Brown of tractor fame. Lagonda's straight six engine, featuring twin overhead cams similar in layout to the Jaguar XK engine, went on to be used in sporting Astons of the 1950s (one reason that many Lagondas were broken for parts, to supply mechanical bits to the more valuable sportscars). In 1961, the Lagonda marque made a re-appearance with the limited-production aluminium-bodied Rapide model, produced until 1965. Most people will now remember the Lagonda name for one reason - the 1970s wedge shaped creation penned by William Towns, a model that did little to boost Aston's sales or reputation, suffering with poor reliability, mainly thanks to the high-tech electronic gadgetry that was incorporated into the design. In many ways a poor relation when compared to the fine cars of the pre-war days that bore this marque badge. Update: IC got in touch, and added to the information I have on the 2.6 Lagonda: ".. the Lagonda 2.6 DHC pictured is SMX10, subject of much period publicity and Amanda Brown's (wife of David) own car until 1950. Extensively restored in the late 90's from a complete wreck - see "Classic Cars" April 1999 excellent article on the subject." Thanks for the new information! Return to the Motoring Miscellanea section. A number of classic Aston Martins also feature in the vintage & classic photo gallery, for instance this shot of a 1961 DB4.